The rose Seafoam was first bred in the United States prior to 1963 by Ernest W Schwartz. Schwartz was a rose breeder out of Kingsville, MD. 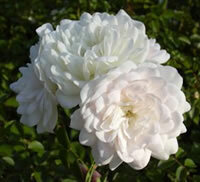 This shrub rose was created by crossing the White Dawn rose with the floribunda rose Pinocchio. 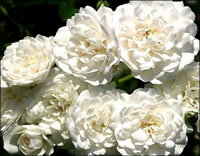 The result was a compact shrub that produces a large number of double blooms that are creamy white in color. The blooms will average about 2.5" in diameter and will be pretty full with about 35 petals or so each. Seafoam roses tend to stay fairly compact and will typically only grow about 2 to 3 feet tall and reach out about 2 to 4 feet across. While the rose Seafoam is considered a shrub rose, it can also be trained to be a short climber and will grow up supports and trellises. Due to its short stature in the garden, many rose growers have also found this variety useful as a ground cover when trimmed properly. Seafoam was one of the varieties that passed the tests of the Longwood Garden's Ten-Year Trials. This rose can be grown in zones 4 and warmer with excellent results. If you are looking for a rose that will bloom over and over then the rose Seafoam might be a good option for you. This rose produces an abundance of blooms and it will bloom in repeated flushes if you keep the plant deadheaded properly. Seafoam is not much different than most roses in that it needs a lot of sunlight to give its best performance. This variety is not likely to do its best work if planted in a location that gets partial shade. You should be looking for a spot that gets a minimum of 6 to 8 hours each day of full sun. 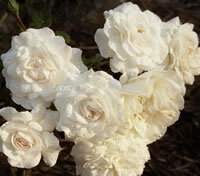 Seafoam roses will also do best if grown in a location that gets good air circulation through your garden. Many novice growers make the mistake of planting roses in sheltered spots, away from the natural air currents within their garden and the result is often a plant that is susceptible to diseases, especially blackspot. Good airflow will help keep the leaves dry and healthy. You will also want to grow the rose Seafoam in soil that is well drained. Soil that stays too damp can often lead to root rot and other diseases. There are really no special planting instructions that are specific to the rose Seafoam, so you can just follow normal rose planting guidelines. The first thing you should do before planting your rose is take a trip to the local garden center and pick up a bag of a good organic compost. When you dig your hole, put the loose soil into a wheelbarrow and mix it with the compost at a ratio of 1 part compost for every 2 parts soil. This will give you a really great soil mix to get your roses started off right. How you go about planting the rose Seafoam depends a bit on where and how you purchased them. If you bought them locally then they were probably already started in containers and ready to go into the ground. All you have to do is dig yourself a hole that is at least twice the diameter of the container and equally as deep. This will keep the bud union at the same depth it was originally planted, but it will leave you ample room around the root system for your soil mix. If you bought your Seafoam roses online, then chances are they were shipped to you as bareroot roses. You should first soak the roots in a bucket of lukewarm water overnight to rehydrate them. Then dig yourself a hole that is as wide as the longest roots on the plant, and deep enough to allow you to set the plant atop a mound of soil and still keep the bud union an inch or two below the surface of the soil. Set your Seafoam in place on the mound and spread the roots out in all directions. Back fill the hole about halfway with your soil mix and water it heavily until it flows around the roots like mud. Then go ahead and fill the hole the rest of the way and give it one more heavy watering. Taking care of the rose Seafoam is pretty straight forward. You will need to make sure that you are giving it ample water without overwatering it. Roses typically will become very susceptible to diseases if they are exposed to constant moisture and are not allowed to dry out. A good rule of thumb is one deep watering each week. You should also give your Seafoam roses a dose of an all-purpose fertilizer in the early spring when the first leaves begin to sprout. Since the Seafoam is a repeat bloomer, it will benefit greatly if you can give it additional feedings throughout the growing season. I will usually give all my roses a second feeding just before the first big bloom. Then I will give them a 3rd feeding sometime around the middle of summer so that it helps encourage late season flushes. You can prune the rose Seafoam in early Spring before the leaves start to form. This will allow you to better see what you are doing. Begin by removing all the dead growth from the plant, along with any canes that look like they might be diseased. Next, you should cut back any canes that overlap one another because these will eventually start to compete with one another for sun light. You can finish up by giving your rose Seafoam a light pruning to give it some shape and encourage new growth. This is the time that you should do a little maintenance around your Seafoam roses. You should take the time to rake up all the dead leaves and debris that has collected there from the previous season. Discard this material in the garbage, along with your cuttings because if left to lay, decaying matter can become a breeding ground for pests and diseases. Finish up by giving your rose Seafoam a nice layer of fresh mulch to start off the new year.